Our three staff veterinarians can take care of all of your animals, whether it’s your child’s hamster or your horse that needs our help. We provide all traditional veterinary services, plus we are available 24 hours a day for emergency care. Voted Moffat County’s Best Tire Store, the Craig Big O Tires is your No. 1 center for tires, wheels, service and savings. Locally owned Chevrolet, Subaru, and Ford dealerships. 24 hour towing, service, and sales. Body shop and parts department. Craig Powersports opened in 1999. Just as it was then, our goal is to be the most courteous and professional powersports dealer in Colorado. As a result, we have become the state’s largest side-by-side dealer! Give us a call or come on in and let us help you in the snow, on the trail or on the road! Ammunition, binoculars and scopes, camping equipment and cookware with some camouflage apparel, boots and clothing as well as certified hay. Ammunition, fishing and hunting licenses, cookware, coolers, deer carts, sleds, camping gear, knives, saws and a full line of Carhartt and Murdoch’s hunting clothes. Pack saddles and bridles, blaze-orange halters, blankets, tire chains and shovels. One of the largest selections of firearms in Northwest Colorado with a huge selection of ammunition, archery equipment, knives, cleaning and reloading supplies and camouflage apparel. U. S. Tractor and Harvest sells and services John Deere new and used tractors, combines, lawn & garden, work products, John Deere replacement parts, and John Deere AMS (GPS) products. Brother’s Custom Processing is Northwest Colorado’s premier wildgame processor. With a combined 50 years of experience processing game, our staff can help to put the finishing touches on your hunt of a lifetime. 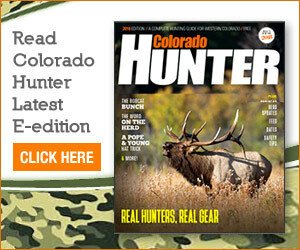 At our school, learn how to mount big-game animals in Craig, Colorado. We are also the home of a professional taxidermy studio. Mountain Man Taxidermy, established in 1991, has been serving hunters of Northwest Colorado for nearly 20 years. Located in Craig, the Elk Hunting Capitol of the World. Offering quality tools, products and expert advice, Samuelson’s True Value is your one stop destination for all your hardware and hunting/sporting needs. Open 24 hours, offering all products including grocery and hunting/sporting. 300-yard outdoor rifle and 50-yard outdoor pistol range for members, but open to the public the first Sunday and Monday of each month. Also open during daylight hours, Thursday and Friday prior to each big game season for rifle sight-in. Public welcome to shoot when range is open. Sporting clays, trap, black powder, rifle and pistol ranges up to 200 yards. Hunter education courses also available. Hunter sight-in Thursdays and Fridays prior to each big game season . Sight-in is $5 per gun, or member shoot for $10. New memberships cost $20 plus dues per person and includes full use of archery, trap, rifle and pistol ranges. We are a pizzeria combined with fine Italian dining. We offer full service bar, with unique rotating micro-brews. Open from 11 a.m. to 9 p.m. for lunch and dinner. Voted Best Lunch and Dinner Restaurant for 2014 and 2015. American dining for breakfast and lunch. Open early to fill you up before the hunt begins. Award-winning Bloody Mary’s. Voted Best Liquor Store in Moffat County four years running. Great selection. Allow the Elk Run Inn to be your home when you are here. Eat out only if you want to, all our units have full kitchens. We are conveniently located in the center of town. Everything is close by; grocery stores, restaurants, liquor stores, post office, shopping, churches and internet access at the library next door. We look forward to seeing you on your next visit to Craig! Join us each morning for Hampton’s free hot breakfast. Even if you’re in a rush, simply grab one of our free Hampton On the Run® Breakfast Bags, available Monday through Friday, for a quick, healthy meal to go. Free high-speed internet access . Delicious food and a fun environment with sports, spirits and spare ribs. Casual Mexican Grill offering fast, fresh, and authentic Mexican cuisine. Year round full-service camping. No reservations required. Free wi-fi, refrigerators and television in all rooms, centrally located in downtown Craig. Specialty Mexican food and margaritas. A locals favorite. “Enjoy Craig , Colorado… and when your head gets heavy, head Westward!” Free WIFI available, fridge and microwave in rooms. A unique college located in a spectacular part of Colorado with a new state-of-the-art campus in Craig. Within three new energy efficient buildings, you may study Nursing in our fully accredited program; work in a number of certificate areas in Automotive Technology; enroll in Massage Therapy and Cosmetology courses; and more. Providing health care to the communities of Moffat County, offering a variety of general care and specialty services. Pioneers Medical Center has served Meeker and Rio Blanco counties for more than 65 years. Area residents, workers and visitors count on Pioneers Medical Center to provide quality healthcare that includes a full-service hospital and Level IV emergency department, the Meeker Family Health Center. A consumer owned non-profit electric distribution cooperative serving parts of Rio Blanco, Garfield and Moffat counties. Rangely is “A Great Place to Live”. It’s also a great place to visit, vacation and explore. The Town of Rangely hosts excellent overnight accommodations and restaurants. We pride ourselves on making our visitors feel welcome and hope that your stay in our community is memorable. The owner and employing broker of Backcountry Realty is a third generation Meeker native and has been a Colorado real estate broker since 1980. Steve and his office are at your service. Specializing in properties in the Meeker area and the beautiful White River Valley of Northwestern Colorado. Experts on Craig and Moffat County real estate with over 60 years experience. Offering residential real estate, recreational and mountain property, land, and ranches. Hayden Outdoors represents the finest real estate for sale, including farm, ranch and recreational properties across the Great Plains and Rocky Mountains. From legacy ranches to farms and cropland, luxury real estate to recreational land, we can help you buy or sell your next property. “We custom print.” We have a large selection of Colorado T-shirts, jewelry, Miss Me jeans, antler jewelry, and much more. Headquarters for BS Outfitters Quality Deer & Elk Hunting. At Intermountain Appliance we inventory the area’s largest inventory of appliances. Whether you are looking for a washer and dryer, refrigerator, cook top, dishwasher, oven or stove — we have you covered. Serving all your appliance needs for 10 years! This family-owned business carries everything from stoves, dishwashers, refrigerators, freezers, washer and dryers and more. They offer outstanding customer service and products that will benefit your family. Offering custom bumpers & headache racks for pickups, SUVs and semis; winches, lights, tow hooks and receivers. Offering UPS and FedEx packing and shipping services. Northwest Colorado’s unique trading post. We carry a large variety of gifts, jewelry, art, etc. The nation’s premier turnkey car wash company. A locally owned kitchen and gift shop. We carry a wide variety of knives, gifts, beer-making supplies and unique items.